Welcome to the Admissions Department at Lake Technical College! Lake Technical College is a public postsecondary institution which accepts applications on a nondiscriminatory basis from anyone having the interest, ability, and desire to benefit from career and technical education programs. To assist students in meeting their goals, there are minimum age, educational, and health requirements established for each program. In addition to career and technical training programs, we offer Adult Basic Education classes, GED preparation classes, and Adult ESOL classes. Lake Tech also offers dual enrollment programs through articulation agreements with Lake County Schools. Our career advisors are happy to assist you with any stage of the enrollment process! Take the Test of Adult Basic Education (TABE), if required. Fulfill additional entry requirements as needed for individual programs. Applicants must be at least 16 years of age and should be academically, physically, and emotionally capable of meeting the essential tasks of the chosen program. Part-time enrollment is available in some programs on a space-available basis. Completion of a high school diploma or GED may be required for some programs. As identified in the Master Plan of Instruction, several programs specify additional admission requirements. Lake Tech accepts high school diplomas from recognized institutions within the United States education system that hold accreditation from a regional, national, or specialized accreditation body. Students, who complete secondary education in a home school setting, are required to submit the Home School Affidavit form which can be obtained in the Admissions Office. 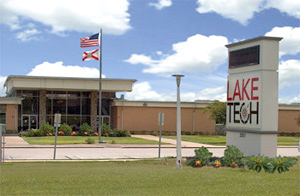 Lake Tech also accepts a State of Florida High School Diploma or a General Education Development (GED) credential diploma. The diploma must be recognized by GED Testing in Washington, D.C. Supporting documentation may be required as to diploma type and the institution’s accreditation. The student is responsible for providing this information. In most programs, qualified new students are accepted several times a year on a space-available basis. These start dates are set forth in the calendar located in the school catalog. Eligible high school students may enroll at the beginning of the first, second, and third nine week periods and must be referred by their home high school.